The World of Tile is Now Full of Colors! According to the Color Association of the United States (CAUS) - an organization which forecasts color tends for manufacturers of environmental and interior products - a major movement toward translucence and transparency with romantic, dreamlike qualities has evolved. The new palette has high degree of warmth- emphasizing red and yellow-influenced color families, which are balanced by the cool, air and water-inspired blues, greens and aquas. This forecast includes both cheerful brights to uplift us, as well as soft, mellow tones to relax us. It's all about "personal choice". - Vanilla and cream are deeper and warmer. Warm taupes, red/browns. and faded blacks help to balance the technology in our lives. - Black & white. Classic glamour from the 30s, along with lipstick red. 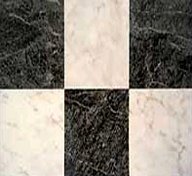 Black listels frame other tiles. - Wow colors from the 50s - lemon, tangerine, lime. Rust is making a comeback with mossy greens and cream. When designing a tile installation, don't just think in terms of individual tiles. Instead think of the whole surface and of adjacent surfaces, textures, and colors. 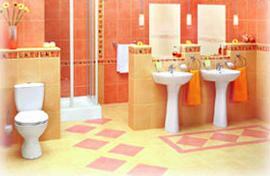 You can be decorative without having to rely heavily on decorative tiles. 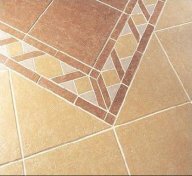 If you want to use specially decorated tiles, be sure they are integrated with the overall scheme. 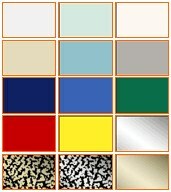 Often you can buy decorative tiles to match the colors and sizes of the manufacturer's regular tiles. If you decide to use a few hand-painted tiles in a wall of commercially produced tiles, make sure the sizes and the colors of the tiles are compatible. If you plan to have a tile artist produce custom work for you, be sure to discuss the colors and function of your total project. Subtel, tone-on-tone designs that mimic fabric finishes like damask. Multiple listels that can be stacked horizontally to imitate stone or vertically to accentuate an arch or other architectural detail. Molded, three-dimensional tiles in small and larger formats to create texture and pattern when used with companion two dimensional pieces. This is especially dramatic in subtle white-on-white or gray-on-gray installations.